We are excited to be a national Shine a Light on Lung Cancer partner! Shine a Light events are hosted by healthcare facilities nationwide during the month of November as part of Lung Cancer Awareness Month. These educational events highlight advancements and treatment options, while honoring and supporting lung cancer patients and their caregivers. Click here to find an event near you! 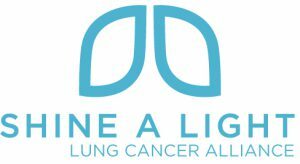 Shine a Light is a program of Lung Cancer Alliance, whose mission is serving and listening to those living with and at risk for lung cancer to reduce stigma, improve quality of life and increase survival.